Get Qualified While You Work! Studying the NVQ level 3 Certificate in Occupational Health and Safety Practice, candidates will develop their knowledge and practice the skills required to manage regular workplace duties from an occupational health and safety perspective. The NVQ is assessed based on your day-to-day working tasks within your role – this is known as “on-the-job training“. Evidence collected in the past 2 years can be submitted towards your NVQ certification. There is no treading over old ground, just pull-up your historic records and connect with your NVQ assessor to check what is suitable. You may already have the evidence in your hands to pass this fantastic NVQ certificate course from ProQual. Who is this NVQ certificate for? This NVQ level 3 certificate in health & safety is typically intended for mid-level managers, supervisors and workers with existing Health and Safety responsibilities involved in their day-to-day working procedures and processes. The aim of this NVQ certificate course is to improve the basic SHE knowledge, understanding and skills of employees. UK Head Office based in Hull, United Kingdom. The NVQ Level 3 Certificate in Occupational Health & Safety Practice is a Higher-Education Level qualification – equivalent to a NEBOSH general certificate. Developed with consultation from SHEilds and IOSH, the NVQ course meets the demanding standards of occupational health and safety practice within any industry. Completing a training course “on the job” is also cost-effective. While undertaking this qualification, your working processes and procedures are reviewed, our assessors will guide you to make improvements, which will be a massive benefit to your employer. A stepping stone for natural progression from the NEBOSH Award or IOSH Level 2 course, to progress your professional development. It’s almost impossible to fail an NVQ, you are either competent or not yet competent. Unlike academic qualifications, there are no exams to fail and re-sit. This means no more headaches for those who struggle in exam conditions. You can complete a Higher-Education Level qualification without having to sit an exam. SHEilds NVQ level 3 is equal to a NEBOSH Certificate or Higher Education A-Level on the UK qualification framework and it is solely based on evidence you produce of your day to day employment. Older qualifications have been removed by IOSH for not meeting their strict membership criteria. The NVQ Level 3 Certificate in Occupational Health & Safety exceeds the requirement for Technical Membership (TechIOSH) leading to Associate Membership (AIOSH). Before you enrol on the NVQ level 3 Certificate, first we need to establish if you are eligible with a quick questionnaire. When you’ve sent us a completed questionnaire, a member of the SHEilds team will contact you to walk through the rest of the NVQ enrolment process. Mandatory Units - What you will learn from this course. Candidates must achieve 31 total credits, studying 5 mandatory and at least 2 optional units. You will continue to perform your daily on-the-job tasks. The documentation you have can then be re-purposed as evidence towards completing this level 3 NVQ Certificate. There are 5 mandatory units you must study, achieving 23 credits or more. You must also choose to study at least 2 optional units, achieving at least 8 credits. Unlimited NVQ support is included with this course. Our assessors will provide you with all the guidance you need to complete this NVQ. How is this NVQ Assessed? Essentially there are 4 steps to passing this NVQ Level 3 Certificate in OHS. NVQ assessors guide you as you submit your evidence. Our internal verifier checks over your submitted evidence. Your evidence is sent to ProQual to be externally verified. Certificate Delivery – Once your work has been checked and passed, we will arrange for your certificate to be posted to you. As an NVQ candidate, you will submit relevant documents against the syllabus criteria. Your evidence is then uploaded to an Online Portal to store in one convenient location. Our NVQ assessors will guide you, providing feedback until you have all the necessary evidence to prove your competency. Our internal verifiers will check your evidence, any issues will be brought to your attention to correct. Once internally verified your evidence is sent to ProQual to be externally re-checked. ProQual external verifiers will check candidate submissions to ensure a high standard is met and satisfied. Finally, once your work has been checked and passed, you’ll receive a certificate as proof you have passed the NVQ level 3 certificate in occupational health and safety practice. We will arrange for your certificate to be posted to you at an address of your choosing. Online learning or e-learning is an electronic means of study or study submission. For this NVQ course, you will use a specially designed easy to use online platform, which allows you to upload your NVQ evidence and other documents. SHEilds NVQ assessors use this same platform to critique your work and provide feedback. Our eLearning platform is fully supported by our UK based Tech Team. We have many options for you to contact us and speak to a member of our team. Provide your details, we’ll get in touch to complete your enrolment. Don’t worry we can answer any questions or concerns. There are no obligations and we won’t try to sell you something you don’t need. We’d appreciate it if you share this page. What is the NVQ Level 3 equivalent to? We have created a chart to show the NQF level of each SHEilds Qualification. This NVQ Level 3 Certificate is the equivalent of an A-Level, a NEBOSH Certificate or other Higher Education qualification. How do I complete an NVQ? An NVQ is a competency-based vocational qualification; you complete an NVQ by building a portfolio of evidence to prove your competencies in the given areas outlined in the syllabus. 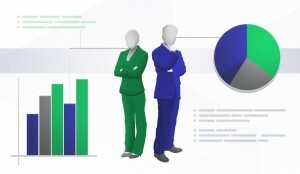 Evidence is then submitted to your online learning assistant where it can then be shared with your assessor who will provide feedback and suggestions. Do I need to pass any examinations to complete an NVQ? There are no examinations to be taken with the NVQ level 3 in occupational health and safety. You are assessed on the content you have submitted to build your online portfolio. How do I submit evidence? NVQ evidence is submitted online to your electronic portfolio system known as ‘Learning Assistant’. Uploaded evidence can be allocated to the associated unit, where it will be assessed. Feedback and guidance are provided by your NVQ assessor. The online ‘Learning Assistant’ has been honed and improved over the many years these qualifications have been running, it’s very user-friendly and designed with the student in mind. How do I know if I am eligible to take this NVQ qualification? To ensure you meet the necessary criteria, NVQ applicants must undergo an eligibility discussion with one of our professional course advisers. During the discussion, the adviser will look at your responses to the initial eligibility questionnaire and register your interest in the course with ProQual. Once you’ve sent us a completed questionnaire, a member of the SHEilds team from your area will contact you to walk through the rest of the NVQ enrolment process. 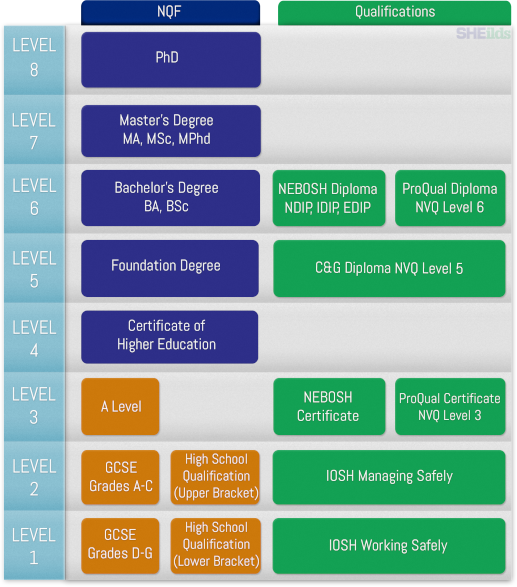 How do NVQs compare to NEBOSH Certificates? Both the level 3 NVQ in occupational health and safety and the NEBOSH level 3 certificate qualifications are rated equally on the qualifications framework. With relevant experience members of IOSH can apply to be a technical member. This is an excellent stepping stone to higher qualifications. Many potential employers now prefer employing those that have completed the vocational route as it proves they have the knowledge AND know how to put this into practice in real-world scenarios. Is the NVQ level 3 Globally recognised? The NVQ level 3 certificate in occupational health and safety qualification is recognised globally and regulated by Ofqual in the UK. This ensures world-leading standards are maintained. Will the completing the NVQ help me gain employment? Holding a recognised level 3 qualification in occupational health and safety will be a benefit to have on your CV or resume when applying for internal promotions or safety-related roles. As with all employment, the applicant’s experience also plays a part. Due to the nature of an NVQ being a vocational qualification, simply holding the certificate proves to prospective employers that you possess the required knowledge and practical skills to fulfill the duties within a health and safety role.